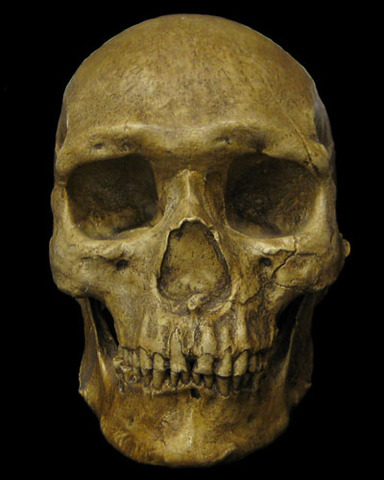 Cro-Magnon I was discovered within a limestone shelter by railway workers. At least 5 Homo sapiens individuals ranging in age from infant to adult were recovered from the site, as well as a number of Upper Paleolithic tools. 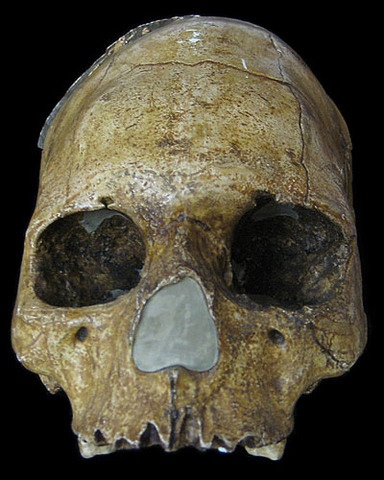 The specimen, dating between 30-32 Ka, includes a cranium, mandible, and post cranial material. 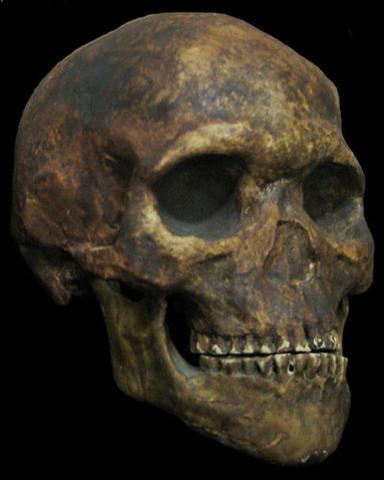 Perforated seashells, animal teeth and bones, and lithics were found in association with Cro-Magnon I; and his remains were covered in ochre suggesting a ritualistic burial. Cro-Magnon translates to "big cliff" which refers to a large limestone massif above the village Les Eyzies1. The Cro-Magnon shelter at Les Eyzies was the first widely accepted discovery of anatomically modern H. sapiens2. Theordore McCown & Hallum Movius Jr. In 1931-1932, the remains of at least 10 adults were discovered in a rock shelter on the western flank of Mount Carmel in Israel. 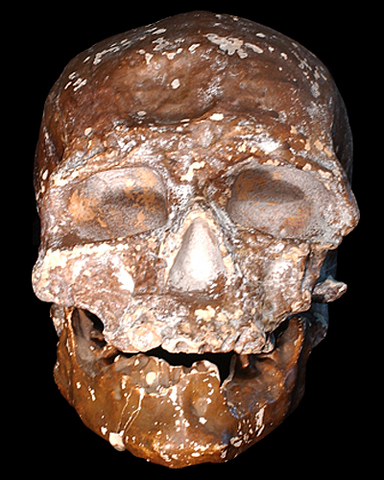 The skeleton known as Skhul V was found in situ among these remain, and dates to approximately 90 Ka2. 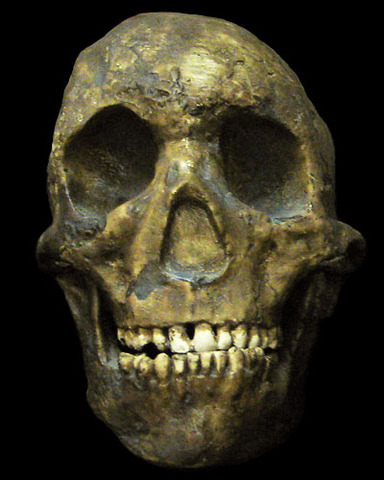 Skhul V was intentionally buried and was appeared to be holding a wild boar jaw to its chest when excavated, which provide implication on the behavior and rituals of early anatomically modern humans1. 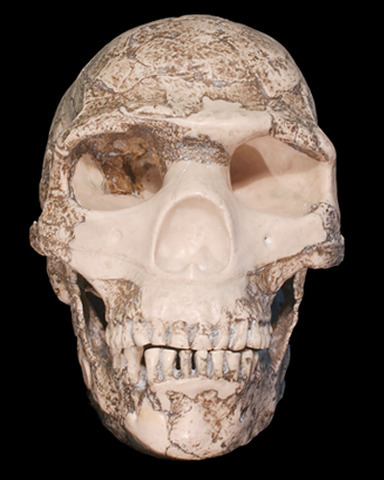 Additionally, this specimen, and other individuals recovered along with Skhul V, provides information on the migrations of anatomically modern humans out of Africa. eFossils is a collaborative website in which users can explore important fossil localities and browse the fossil digital library. If you have any problems using this site or have any other questions, please feel free to contact us. Funding for eFossils was provided by the Longhorn Innovation Fund for Technology (LIFT) Award from the Research & Educational Technology Committee (R&E) of the IT governance structure at The University of Texas at Austin.